The Merry Widow, the operetta by Austro-Hungarian composer Franz Lehár, still flourishes on the world’s stages with its romantic themes, bubbly hedonism, popular arias and lilting rhythm. No expense was spared on the lavish costumes fashioned from silks embellished with feathers, beads and jewels in this frothy production with its lure of easy-on-the ear and eye escapism. After all, Australian State Opera Companies pooled resources in a bid to stage this classic flamboyantly. But all that glitters is not gold. Costume Designer Jennifer Irwin’s art deco, low-waisted frocks were sumptuous. Fashioned from deluxe fabrics, beaded glittery trim and period bling, the gorgeous look kept on giving with such a vast presence on stage. But it takes more than fashion, sophisticated lighting design by Damien Cooper and an admirable art deco set by Michael Scott-Mitchell to fire a production. Star-soloists, Opera Q’s Chorus, Queensland Symphony Orchestra and conductor Vanessa Scammell all contributed efficiently to this razzle-dazzle production by acclaimed director and choreographer Graeme Murphy, yet it failed to sizzle and scorch despite a high-kicking, troupe of saucy, can can dancers, revered tenor David Hobson in the role of Count Danilo and Natalie Christie Peluso as Hanna Glavari, who threw heart and soul into the role. 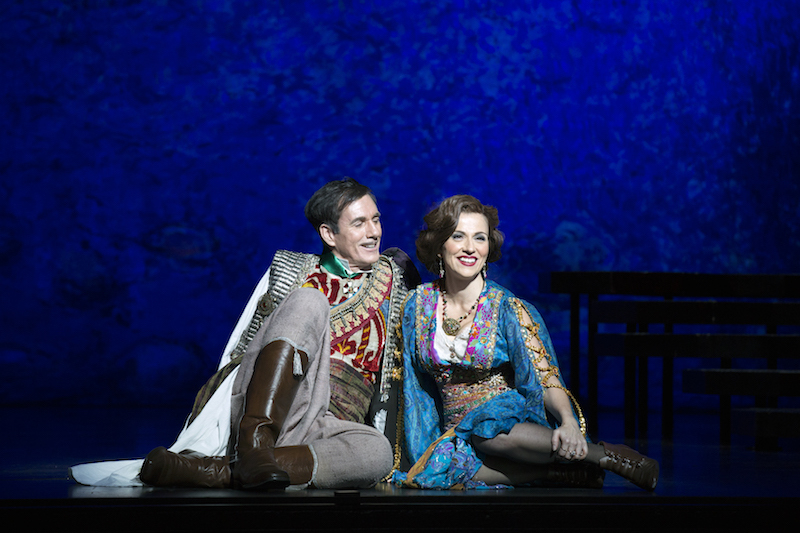 The plotline is threadbare, nothing new when it comes to opera. But the point is that two-dimensional story-telling, is easily forgiven when the singing is rich, heartfelt and seductive. But magical delivery of Lehar’s hummable tunes was in short supply and awkwardly miked which distorted the vocals, inhibited robust projection and frequently brokered harsh tone. The amplification – though its use is understandable given the Lyric Theatre’s mean resonance – hindered rather than helped sound quality. But is The Merry Widow really the best or even most suitable operetta State Opera Companies can come up with fuelled as it is by rampant misogyny? Women are weird, chattels, conformist wives, frilly-knickered tarts or alone on a pedestal. Hanna, the idealised, is a looker, mysterious, a wild party animal who kicks up her heels. There’s a saintly side too. When the Baron discovers his wife Valencienne (Katie Stenzel) is embroiled in a dizzy flirtation with Camille de Rosillion, respectably sung by James Rodgers, Hanna declares her devotion to Camille and intention to marry him. Hobson, looked the part, but wasn’t in good form. His portrayal of Count Danilo flickered on and off conviction wise. Peluso glammed Hanna up to the hilt. Ironically, her character was repetitively swooped up in the air, lifted by male admirers yet Peluso seemed to carry the weight of the production on her shoulders. Her silvery-toned contributions and eye-fluttered pizazz entertained but wasn’t enough in this literal, historical 19th-century interpretation for the show to soar. Why not modernise? Because serving it up old style fell flat. Murphy’s claim that the operetta “transports us to a world far from the babble of the now” is not necessarily a desirable outcome if its relevance is questionable. A clever musical that moves forwards and backwards through a broken marriage.